The first bullet hit the wall next to Jane’s head, she cried out to me, Sean, you cant use that cheap line just to get people to read about our farm trip, but it was too late! En route, Carlos told us all about the farm and gave us a brief outline of todays activities. 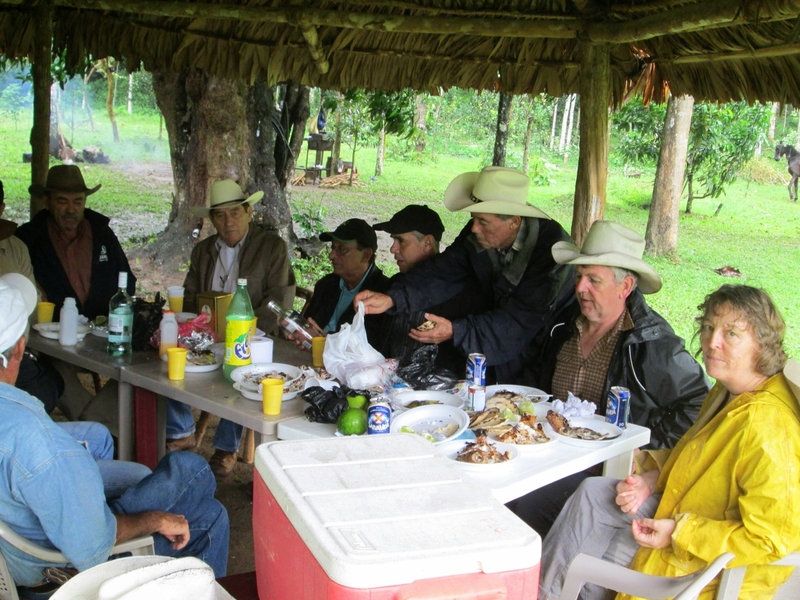 To start, a horseback ride around the farm , followed by lunch then off to the hot springs just down the road and then dinner. I’m sure that Jane (who is sitting next to me, also blogging) will describe better than me what an amazing day we’ve had. The ride was awesome, the horses calm, sure footed and forgiving (neither of us had sat on one since aeons) we climbed hills, rode amongst the cattle and the best bit for me, forded fast flowing streams. Jane, a girl not noted as an equine fan was first up and having been given the most basic of instruction gamely took the reins and headed down the track, every day she does something that makes me love her more and reminds me how lucky I am.. The lunch was great, all food off the farm including the coffee which was probably the best cup I have ever drank. The afternoon spent at the thermal springs was equally special, pools of different temperatures, stepped down the side of a steep forested hill. The water temperature as it surfaced was 90 deg and by clever layout it is blended with that of a cold water course to heat each pool differently, the higher you go, the hotter it gets. A couple of hours there (more or less had the place to ourselves) was not only great therapy for our saddle sore greenhorn bodies, but being able to lounge in a hot spring surrounded by lush tropical forest was an experience of a lifetime. Day 2 started with Jane and I enjoying a lazy breakfast prepared by our cook Irma that ended only when Carlos returned. He then took us for a short stroll through the lush grounds surrounding the house, showing us the various plants and trees growing there. 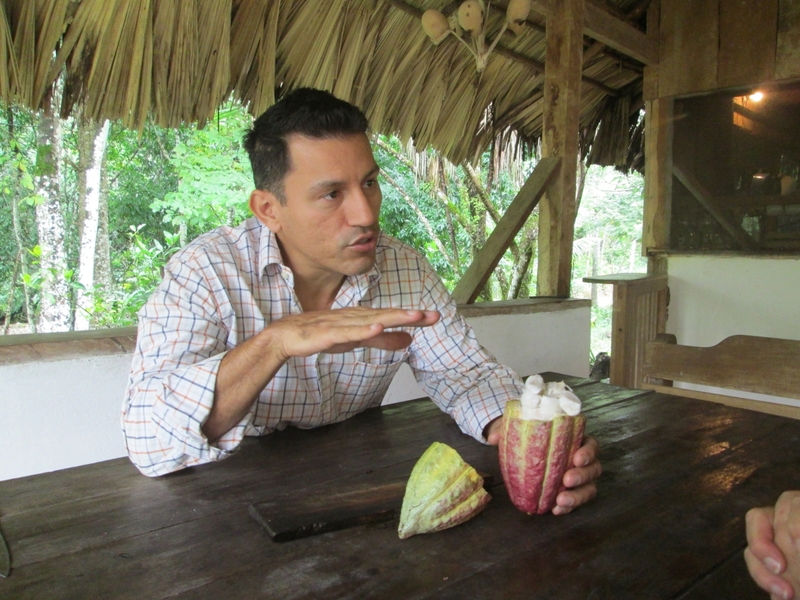 The trees he was most enthusiastic about were the cacao, he explained about the different varieties and when they were ripe for picking. Afterwards, back in the kitchen area we got to see the cacao beans from the pod through to the drying and roasting stages, finishing off with a cup of 100% hot chocolate, delicious doesn’t begin to describe this rarest of rare treats. Then it was of to visit the coffee bean processing plant built by Carlos’s grandfather. I cannot think of an appropriate way to describe this installation but here goes, it is, to my eyes at least just about as good a balance between technology, human ingenuity, environmental sustainability and quality of end product as is possible to get. The process starts immediately after harvesting, time is critical the beans must not over ferment or they degrade, bulk of the sorting and sifting of the beans happens in a series of water channels before either Sun drying (weather permitting) or loading in to drying drums, these are rotated by water turbines powered from a mountain spring, the hot air for drying comes from furnaces burning timber cut as part of the forestry management plan. The process does involve an element of manual labour that not only provides some jobs (e.g. spreading the beans out in the sun and turning them) but thanks to the skill and knowledge of these workers, a first class end product, coffee like you’d never believe! 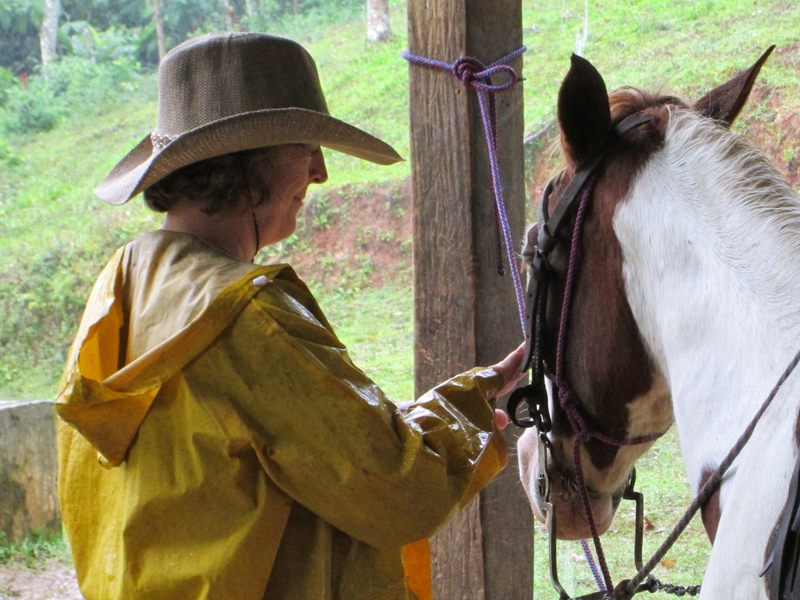 After that it was back on the horses (ignoring the by now fairly heavy rain) to ride up the mountain to see a hydroelectric plant installed 3 years ago by Carlos’s father. Again another piece of inspired technology, supplying power (700kWh on our visit running at 84% of capacity) that is sold directly to the grid. Not a huge amount (enough for 700 one-bar electric fires) but Hondurans don’t use energy anything like we do and this is clean, sustainable power. Now even more impressive (is that possible you may ask!) is that when building the turbine/generator house Carlos’s father decided to landscape the area, dig two fishing lakes and build a rancho (a sort of thatched gazebo) to form a recreational area for the family. When we rode up today, his father was there entertaining a bunch of his old chums with loud 1940’s Mexican music, fresh caught fish on the barbeque and a table load of booze and we got invited to hitch our horses to a tree and join them 🙂 Jane remarked to me between mouthfuls of delicious fish, local cheeses, toasted tortillas washed down with Honduran beer “this is the sort of thing you see Jamie Oliver do on his shows, but this is real and not set up by researchers” I had to agree with her, it was indeed pukka! On the subject of senior Carlos senior, this is the second time we have encountered him, yesterday we very briefly met at his house and exchanged greetings and today holding court with his acolytes. He is a man of average height for these parts but so clearly carries the air of authority and bearing of a man not to trifle with. This aura is not diminished by his advanced age (78) he clearly carries the genes of his pioneering father and I rather suspect is a tad fearful of what the future holds for this small farming dynasty. The farm setup reminded me of old established Norfolk farms, back in the days before mechanisation and “progress”. I came away with a sense of old fashioned paternalism, the boss is not only responsible for a large workforce, often through generations but also providing housing (mostly tied properties) and to an extent education and welfare. This is a model we have abandoned as archaic and inefficient, but there is a strong argument that says it works here in Honduras and that in our cleverness we may have thrown a bit of the baby out with the bath water. Carlos our fantastic host, explains the mystery of chocolate to us.